Is that true? The other day, Market Leader interviewed Evgeniy Filichkin, Managing Partner at FortFS, CEO of cryptomarket liquidity provider FortFC, Board Member of international holding FFS, which is one of the world's leading forex brokers. Mr. Filichkin agreed to answer some of the most burning questions for cryptomarket traders and investors and shed some light on the cryptomarket-related plans of Fort Financial Services. Recently we received a lot of questions regarding the future of Bitcoin and other crypto currencies, therefore we decided to interview someone who can expertly answer all these questions. We are glad to publish our interview with Evgeny Filichkin - the Managing Partner of the FortFS broker, CEO of FortFC crypto currency liquidity provider and a member of the board of directors of the international holding FFS. Question: Evgeny, do you think that crazy demand for Bitcoin and other digital currencies is already behind or do the crypto currencies expect a new growth spurt in the future? Answer: I believe we must take a look at this issue from the different point of view. We must look at the development of the entire crypto industry as a comprehensive process. Indeed, at the first stage, the appearance of crypto-currency was perceived by society as an alternative to the classical fiat currencies. During these times much has been said about the expected collapse of the established banking system and, naturally, this fear stimulated the demand for crypto-currencies by many people who were interested in diversifying their investments and savings. This was the main reason for the massive demand that caused the rapid growth of the majority of digital currencies. However, at that time, very few people realized that the main purpose of a crypto currency is just to ensure the trading and calculations in the new emerging economy, which is now called the crypto industry. Accordingly, as soon as the understanding of the crypto- currencies nature penetrated into the mass consciousness, demand declined significantly leading to a price reduction. This understanding that the crypto currency is just a mean of calculating within the new ecosystem influenced many investors and that was the reason why many huge investors have ceased to perceive, for example, Bitcoin as just an investment tool. Question: So you want to say that there are no more prospects for investors in digital currencies? Answer: Definitely, the prospects have remained and they are colossal! However, these prospects must be considered a little bit differently nowadays. The fact is that the ideas of all the services and products that are now actively developing within the crypto industry are very relevant and have a serious growth potential. And for investors to benefit from this growth, it is necessary to invest directly in key facilities of the crypto economy. That is why the interest of large investors has shifted from investing in digital currencies to investing in projects that operate on the basis of the digital economy. These projects, now give investors the opportunity to invest the accumulated profits from the growth of the Crypto-currency in the acquisition of tokens within the ICO. Thus, wise investors, that have already earned on the growth of the Crypto-currency, will earn in the future again on the growth of ICO project tokens. Question: What should do those people who did not manage to participate in the growth of the Crypto-currency? Should they buy a crypto currency now? Answer: Of course, it is necessary to buy crypto currencies now, especially since their price has now become more balanced and much lower than for example half a year ago. However, now it is necessary to buy crypto-currencies for a specific purpose - to invest the purchased crypto currency into ICO project tokens, which are the key for the further development of the entire crypto industry. In this case, investors will benefit undoubtedly from the subsequent growth and development of the entire crypto industry, regardless of fluctuations in the rates of individual crypto-currencies. Question: How can an ordinary investor determine which ICO project will grow along with the development of the crypto industry? Answer: The main criterion for the correct choice of investments in the ICO project is the extent to which this project is important for the development of the crypto industry. Those projects that are important - will fastly grow, and so will the price of tokens of these projects, and the pace of this growth I believe will surprise many investors. To make it easier to understand, imagine that the greater part of the accumulated profits from the past growth of the crypto currency is already gradually pouring into the tokens of promising ICO projects! And this is only the beginning of a new global trend. Question: Does FortFS broker work on the development of such ICO projects that are important for the development of the whole crypto industry? Answer: Indeed, we have long been integrated into the global trend and are participating in the development of the crypto industry with our projects. Within our international holding FFS, which consists of the licensed FortFS broker and several FinTech companies (ERA Today, ERA Technology, etc. ), we created our ICO project - Fort Financial Crypto Services (FortFC). FortFC, www.fortfc.com is a backbone project since it solves the lack of liquidity problem on crypto-currencies market for all participants of the whole crypto industry. To be brief, FortFC is a liquidity aggregator that provides a unique set of services to crypto-brokers, crypto-banks, crypto-exchangers, investments funds, some crypto exchanges, etc. In short, all key participants in the crypto market are somehow depend on good liquidity for effective functioning and FortFC pre-aggregates and provides deep uninterrupted liquidity exactly when it is needed, for example, for crypto broker or exchanger or investment fund, etc. Question: When to expect the launch of ForetFC? Can investors buy FortFC tokens? Answer: FortFC has been successfully operating since January 12, 2018. Of course, the first client to whom FortFC began to supply liquidity was the FortFS broker, which provides its clients with trading on crypto-currencies. In addition, we have already connected a few more corporate clients, including a crypto-broker and crypto fund. To date, the turnover within the provided liquidity has already exceeded 5 million USD. We continue to actively expand the FortFC customer base and we are planning to offer a unique product for private traders too. The official website of the ICO FortFC is already open for all interested parties to learn more about this project. Question: It turns out that ICO and in fact the sales of FortFC tokens has not yet begun, but the project has already started successful operations? Answer: Exactly! We believe it is right to discuss with investors a really working project based on specific figures and consequently real growth prospects for FortFC. We believe that investors in FortFC tokens will feel confident and understand what they are investing in, how it works and what development and growth the project expects in the coming years. according to White Paper and the business plan. Question: When will investors be able to get acquainted with the project in detail and buy FortFC tokens? Answer: The Private sales of tokens already started! 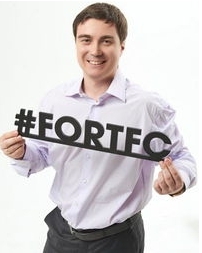 The FortFC website www.fortfc.com contains all the legal documentation and video about the project, as well as detailed information about the tokens, prices, bonuses and discounts. We strongly believe that many smart investors will contact us during pre-sale period to purchase tokens in advance with discounts.